James highlights a different orchestral instrument (wind, string or brass) in each class, such as the trumpet, French horn, violin, flute, clarinet, recorder and accordion. After 45 minutes of music, the children rush over to the healthy-snack table, then grab a toy for playtime while parents and caregivers catch up with friends. 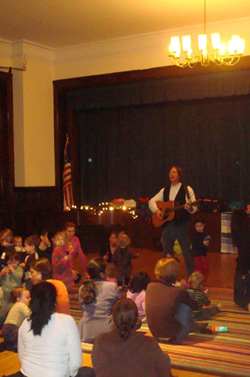 Unlike most children's music classes in Manhattan, Music with James is a drop-in class. You may pay for each class or buy a ten-class series that never expires. Now in our Twelfth Year! You may pre-pay by credit card above, or else bring cash or check (payable to: James Humphrey) to class. The 10-pack of classes is also drop-in; classes do not have to be used consecutively. Please email MusicwithJames@gmail.com for more information about this class. ©2019 James Humphrey. All Rights Reserved.